The Tree Warden scheme was launched in Hampshire in 1989 by Hampshire Wildlife Trust, East Hampshire District Council and the Tree Council. Initially 28 Tree Wardens enrolled in East Hampshire and later in 1990 the scheme spread to other District and Urban areas in the County. By 2000 there were around 300 in Hampshire. 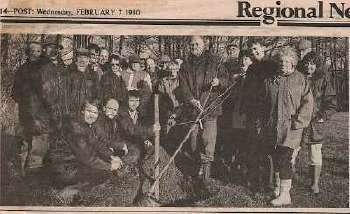 East Hampshire's Tree Wardens starting their first training day at Penns Place, Petersfield on 3rd February 1990. In the foreground squatting are Stephen d'Este-Hoare - East Hampshire DCs arboricultural officer, Iain Blair-Brown - HWT's Woodland Advisory Officer and Jon Stopes of the Tree Council who was and still is the national co-ordinator of the Tree Warden Scheme. Ten TWs that had been with the scheme for ten years attending the 10 year celebrations in Winchester. 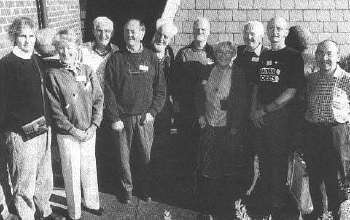 Hampshire TWs own newsletter "Newsleaf" started in April 1990 and ran for 10 years until Summer 2000. I keep a complete set of these newsletters as they make a good reference to TW activities in Hampshire during this period. Nationally "Tree Warden News" was produced by the Tree Council from 1994 to 2004 and now replaced with "The Tree Guardian with Issue No.1 in Summer 2004. This is sent free to all Tree Wardens by EH District Council but there is currently no printed local newsletter. This website is therefore a means of EH TWs keeping in touch with each other. In recent years the numbers of active Tree Wardens in East Hampshire has dropped, partly due to age and "retirement". The need for wardens is however greater than ever for local "on-the-spot" guardians since the threats to trees from disease and urban development has increased at a time when their environmental importance is rising. EHDC arranged a Tree Wardens meeting on 10 July 2007 to discuss some of the current problems and to decide the way ahead. About 20 TWs attended and Jon Stokes from the Tree Council first gave a most encouraging and enjoyable talk. A number of current issues were raised and these discussed by a core group made up of about six TWs at meetings September in Petersfield. Forums are held annually around the country. TWs in Hampshire have an opportunity to meet fellow TWs from Surrey, Kent, Sussex and London area and listen to inspiring speakers. I have thoroughly enjoyed all these occasions, held in excellent venues such as Wakehurst, Bedgdebury, Windsor, Lewes, Dorking, in 2006 West Dean north of Chichester and in October 2007 at Kew Gardens. Amongst some of the notable speakers were Tony Kirkham, Ted Green, Derek Patch, Chris Baines, Chris Howkins, Archie Miles and not least John Stokes who does most of the organising and chairing the meetings. This year the South East Forum is to be held on 1st November at The Maltings in Alton and the speakers will include Fred Hageneder and David Lonsdale. There will be visits to the Farringdon Yew and a town tree walk in Alton. Details should be received by all TWs in the post. Visits to the Farringdon Yew and Alton's Treescapes. National Tree Week 26 Nov to 7 Dec 2008 celebrated annually to launch the start of the winter tree planting season. Walk in the Woods Festival in May each year. For over 10 years now TWs in Horndean lead an evening walk on the first Wednesday in May around Ancient Lanes and Hedgerows, details are published in the HWT Wildlife Diary and the Hampshire County Guided Walks programme. Also the parish rangers organise a Woodland Fair at Catherington Lith in May. Seed Gathering Season 23 Sep-23 Oct 2008.In Horndean Seeds (and seedlings) of native trees are collected most years and the parish has a good stock of young trees ready for planting, the only problem is finding suitable planting sites. In the pictures below, Sessile Oak Quercus petraea acorns (Germinating) and Wild Service Tree Sorbus torminalis berries were collected from Yoell's Copse in October 2006. In the middle picture our Grandson, Jordan was carefully planting some acorns. Wild Service Tree berries are divided into 2 portions. In one portion seed was removed from the berry and stratified, the other portion was planted after squeezing into woodland leaf compost in deep trays, needing protection from mice, squirrels and birds by wrapping in a fine mesh material. We have not tried the third method of eating the berries and recovering the seed later ! From seed 5 years ago we have several good seedlings and those planted 10 years ago have now grown into healthy trees about 8 foot tall. Occasionally they hybridise with Whitebeam, but the mature hybrids in Yoell's Copse have not yet produced fertile berries. An excellent little book, telling you all you need to know about growing trees from seed has been produced by the Tree Council, The Good Seed Guide. many of the illustrations in this book were by Christine Darter, a local artist and former tree warden. Hedge Tree Action Plan A 5-year action plan started in 2003 to explore the future for hedge trees in the British landscape. Are opportunities for TWs to help with hedge tree plantings and tree tagging. The Tree Council is also asking TWs to send them recipes that use flowers, fruits and leaves from hedges. Details of these projects are in the Tree Guardian Issue No.13. There are so many good books published on trees, covering so many different aspects that it is difficult (at my age !) to find time to read them all, even harder to find shelf space so I am now very selective. Some are just for reference, others a good relaxing read. I have listed ten that I most commonly take off the shelf and this list does not include those used for identification of species. 2. "Trees of the British Isles in History & Legend" by J.H.Wilkes (1972) - Full of interesting stories behind many of our ancient trees with many photos which are now a historical document. As a member of the family I have inherited his proof notes and a vast collection of his original photo slides. Many I cannot identify but it is good fun trying to find them in travels around the country.Perhaps I will put some up on the website to see if anyone else can identify them. They were mostly taken in the '60s and many he had worked on as a tree surgeon, (he claimed that he had never fallen out of a patient). "The Blasted Oak - The Oak Tree: Natural History, Art and Myth in European Culture" illustrating the work of many famous artists. Warning, this will change the way you look at oak trees. 6. "The Heritage Trees of Britain and Northern Ireland" by Jon Stokes and Donald Rodger (Constable 2004) describes many of the old favourites and a few new entries with superb photos by Archie Miles and Ed Parker. 7. "Tree Heritage of Britain and Ireland" by Andrew Morton. Similar to other books but published earlier in 1998 and more of a touring gazetteer with location maps, useful when visiting a particular area. The author has also published a good little book "Trees of Shropshire"
8. "Ancient Trees, Living Landscapes" by Richard Muir (Tempus 2005) A very readable book linking with history and archaeology. Has written many other books, two of my favourites being "Hedges"; and "Fields". 9. "The Trees that made Britain" by Archie Miles (BBC Books2006) Accompanying the BBC2 Series of that name and well illustrated. 10. "Trees" by Benjamin Perkins (1991) Included in my list because of the superb illustrations depicting each stage in the development of leaves, twigs and fruits. www.forestresearch.gov.uk Foretry Commission (at Alice Holt) Tree News, protection, diseases, woodland management. www.british-trees.com Woodland Trust, Native tree guide, Ancient tree hunt. www.tree-register.org Record of notable and ancient trees (TROBI) Membership £12 p.a. www.westsussex.gov.uk/ Can download excellent newsletter(Broadleaf) of West Sussex Tree Wardens.